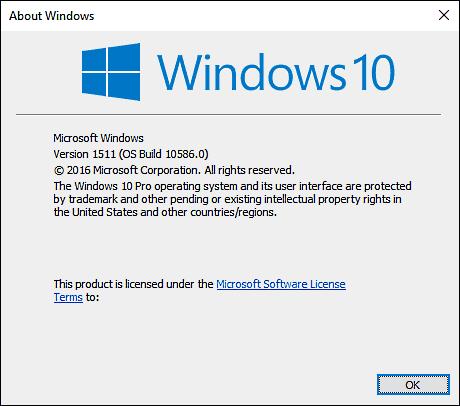 Once you upgrade to Windows 10 from Windows 7 or Windows 8.1 you will discover that you only have 30 days to test the new operating system from the time you upgraded to recover your previous version of Windows. This is not the case if you have already purchased a Windows 10 license and you’re facing the “Windows will expire soon” message. If that’s what’s happening to you, this is the guide you should read (click here). 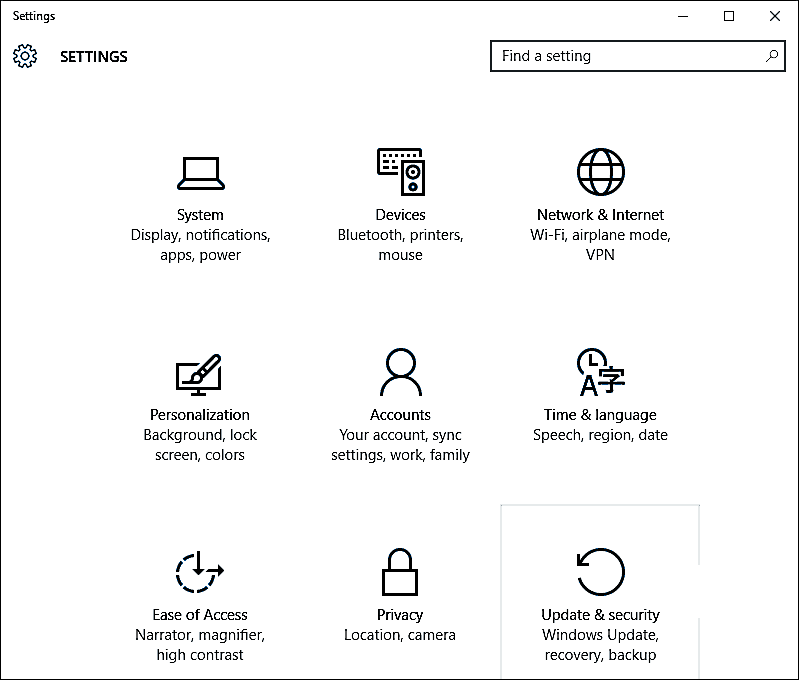 Back to the first case: you upgraded your Windows, 30 days might not be enough for you to test and get used to Windows 10 especially when you have long work hours, family vacations, weekend plans or anything that restricts you from using your PC. Here is how you may extend 30 days and still go back to your previous version of Windows. 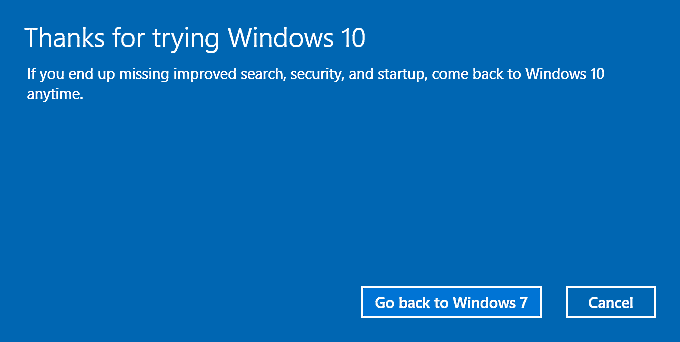 Notice the ‘Go back to Windows 7 or Windows 8.1 option. After 30 days this option will disappear. You need to make the changes described below now, don’t wait until the 30th day to do so. Note: The information below is divided into 2 categories. The first one is for the users who have installed the latest Windows 10 version 1511 (Built 10586). The second one is for the users who upgraded to Windows 10 at the time of launch but did not install the 1511 update. Also note: You need to perform these steps within 30 days of the update. 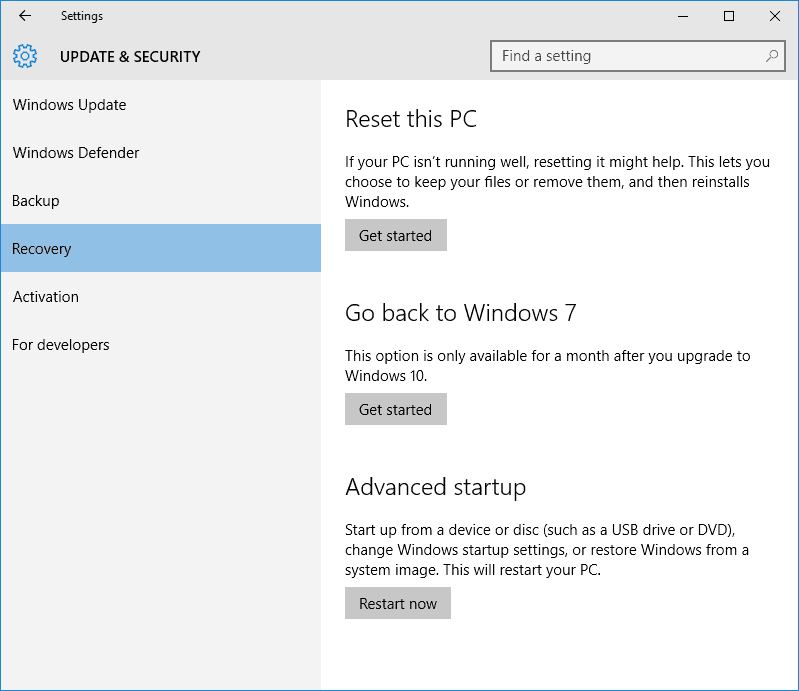 Check which version of Windows 10 is installed on your PC? 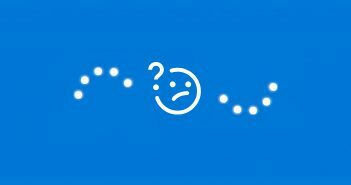 In the Cortana / Search box enter: winver and hit Enter. You should see a run command named winver as a result. Click on the ‘run command’ option and the “About Windows” box will display both the version number and OS Build number). Start by enabling the Hidden Items. To do so, launch File Explorer and select the ‘Local Disk (C:)’ drive partition (primary partition). Now click on the ‘View’ tab and select the ‘Details’ option. Now place select and place check-marks in the ‘File name extensions’ and ‘Hidden items’ boxes. Next near the right end the bar there is an ‘Option’ tab, click on it and click the ‘Folder Options’/ ‘View’ tab. 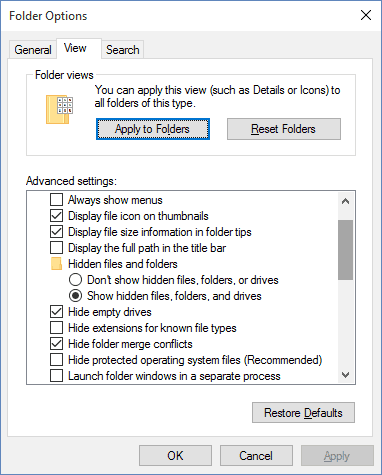 Now select ‘Show hidden files, folders and drives’, remove the check marks from: ‘Hide extension for known file types’ and ‘Hide protected operating system files’. You will now notice a lot of additional files located at the root (C:\) level of the disk drive. Two of these folders must be renamed to protect them from being deleted 30 days after you have upgraded to Windows 10. 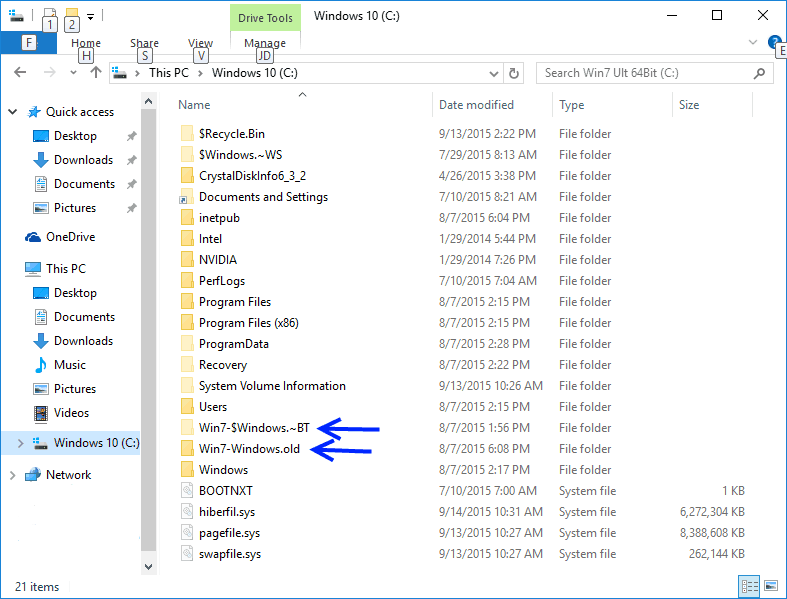 In File Explorer right click on C:\$Windows~BT and rename it to Win7-$Windows~BT (or Win81-$Windows~BT). 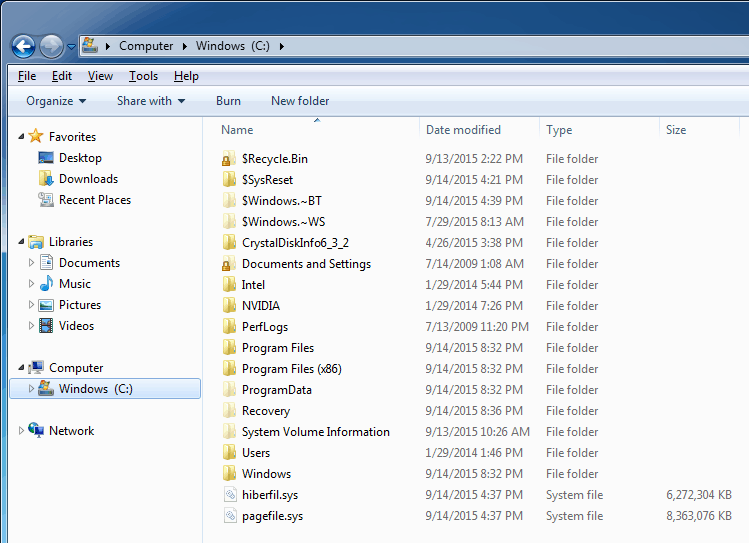 Next right click on the C:\Windows.old folder and rename it to Win7-Windows.old (or Win81-Windows.old). When you have finished renaming these two folders you should see the following. Note: If you have Image Backup software installed make a backup of Windows 10 after you have renamed the 2 folders. When and if you choose to recover / roll back to Windows 7 or 8.1 should something go wrong with the rollback process just restore the backup and try again. 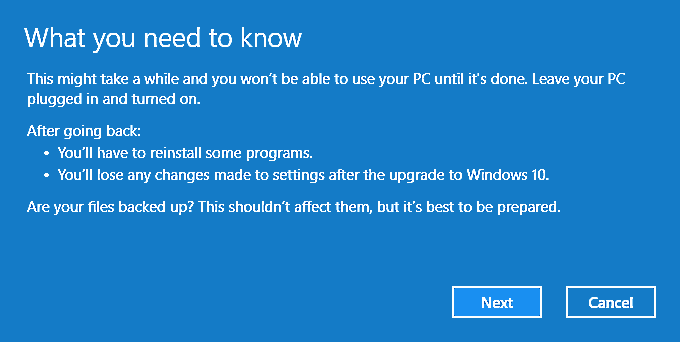 You already had the original release of Windows 10 installed after having upgraded from Windows 7 or 8.1 and you previously followed the instructions listed in part 1 within less than 30 days after upgrading to Windows 10. Now you find that the Windows 10 1511 update (Build 10586) has been installed and there is a new Windows.old folder in addition to the one you renamed in part 1. If you haven’t already done so, start by launching File Explorer and select the ‘Local Disk (C:)’ drive. Now select and place check-marks in the ‘File name extensions’ and ‘Hidden items’ boxes. Near the right end the bar there is an ‘Option’ tab, click on it and click the ‘Folder Options/ View tab. ‘Hide extension for known file types’ and ‘Hide protected operating system files’. You will now see a number of additional files located at the root (C:\) level of the disk drive. Two of the folders (Win7-Windows.old and Win7-$Windows~BT) you already renamed to protect them from being deleted 30 days after you have upgraded to Windows 10. You will also see 2 new folders as the result of installing the 1511 upgrade (Windows.old and $Windows~BT). 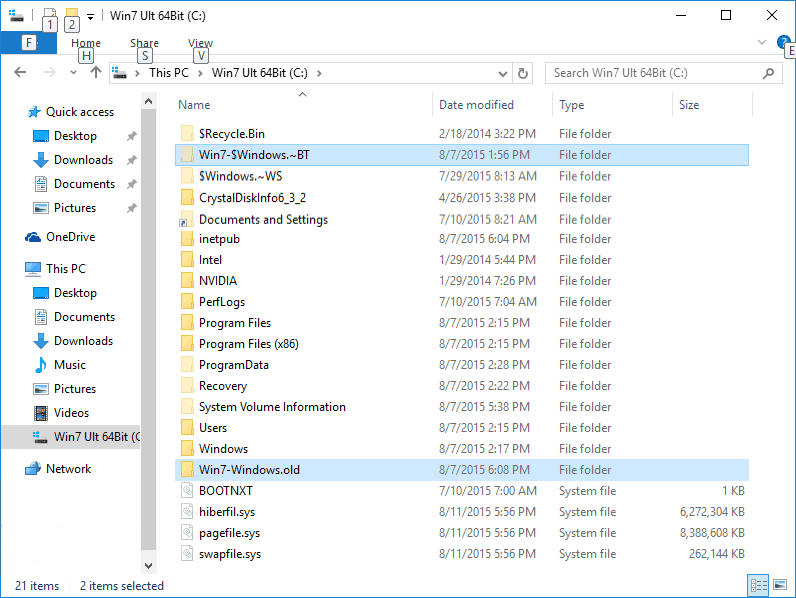 You must rename these folders using the same technique described in part 1, but this time the names will be Win10_Ver10_$Windows~BT and Win10_Ver10_Windows.old. After you have renamed these folder you will see 2 sets of renamed folders as shown below. 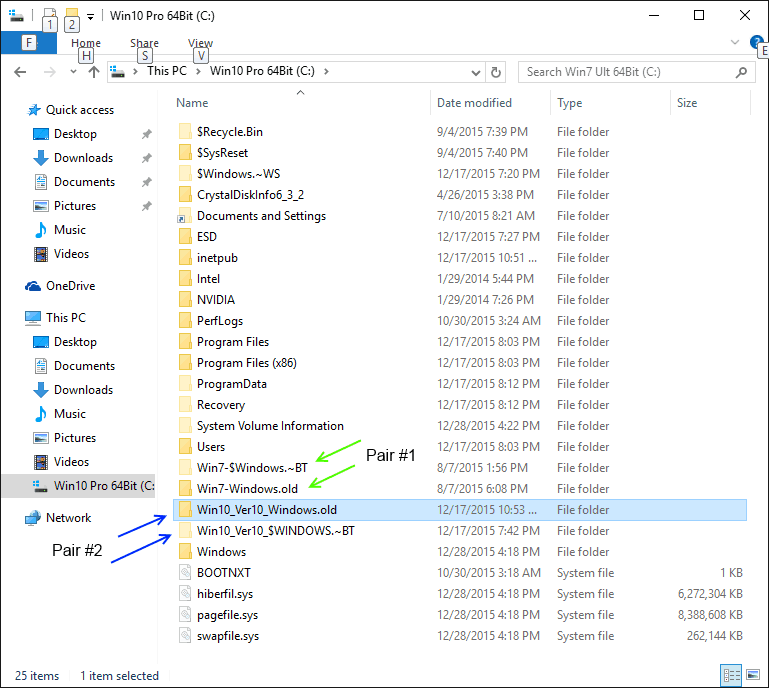 The 1st set with the Win7 prefix contain the files and folder you need to roll back / restore Windows 7 (or 8.1) and the new set (pair #2) with the Win10 prefix. 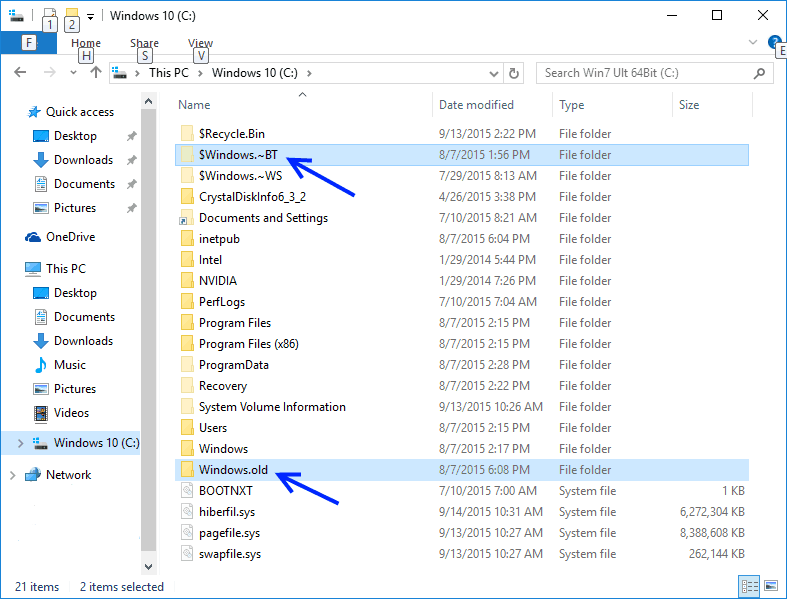 Note: If you fail to rename the second pair of Windows.old and $Windows~BT folders before the 30 day time limit they will get deleted and then you will no longer be able to use the original set of folders (pair #1) you renamed short after upgrading to Windows 10. Once pair #2 has been deleted, it does not matter if you remove the Win7 (or Win81) prefix to restore the original pair of folder names the roll back option will not be listed. 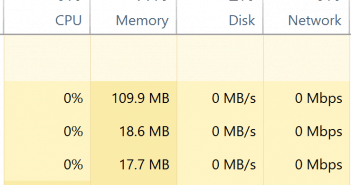 The reason these 2 folders (Pair #2) are deleted is a scheduled task that runs Disk Cleanup (with the ‘Clean up system files / Previous Windows installations options’ selected) 30 days after the upgrade to version 1511 or the next major update after version 1511. 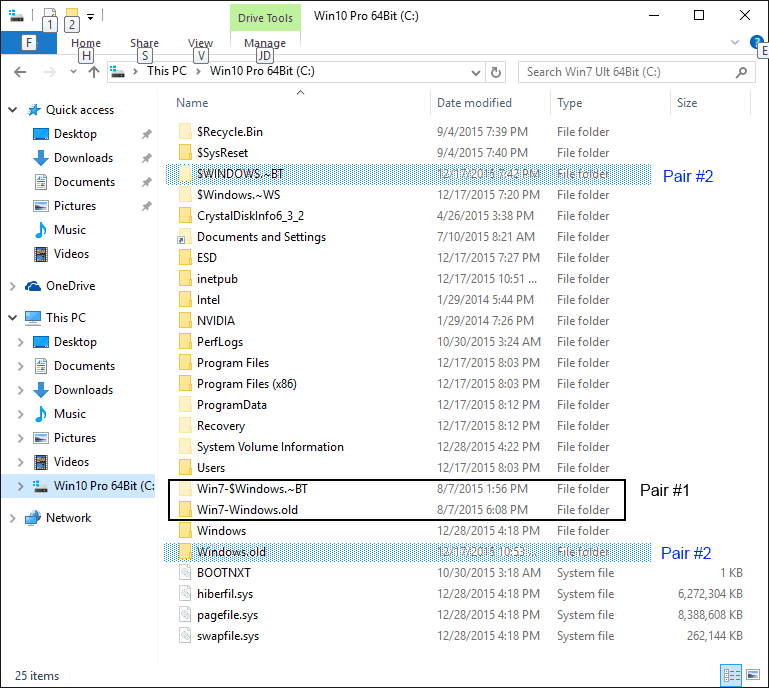 Once you have renamed the folders as shown below – the second pair (Pair #2) will prevent the deletion and allow you to roll back to Windows 7 or 8.1 per the instructions in Part #3 of this article. First, backup any new data files to external media (USB Flash drive or DVD for example) you may have created while using Windows 10 in case they need to be restored after the process has completed. 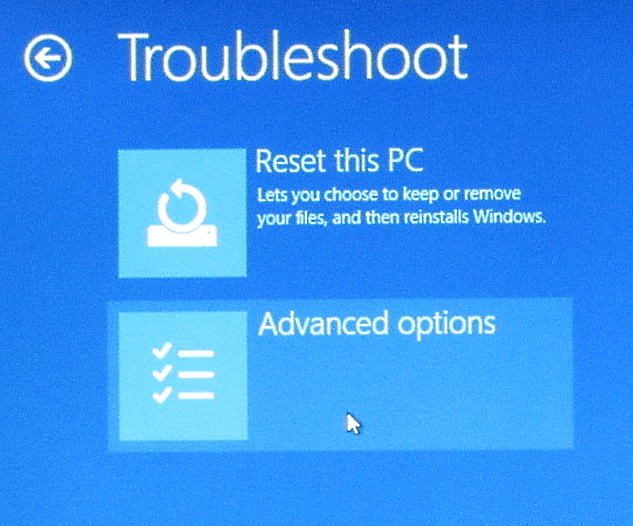 Click on the Recovery option and then click on the ‘Go back to Windows 7 (or 8.1)’ Get started button. 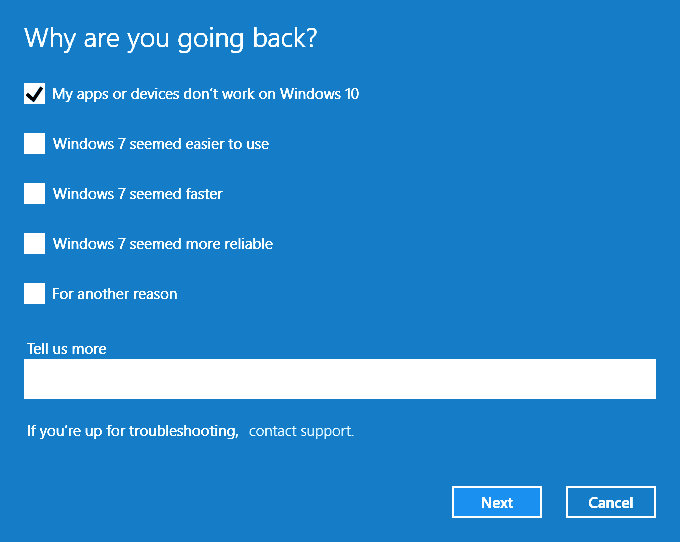 Note: If the ‘Go back to Windows 7′ (or 8.1) option is not listed then skip to Part #4 to access the ‘Go Back’ option and continue with the steps listed below. Select the option that best describes why you are going back. 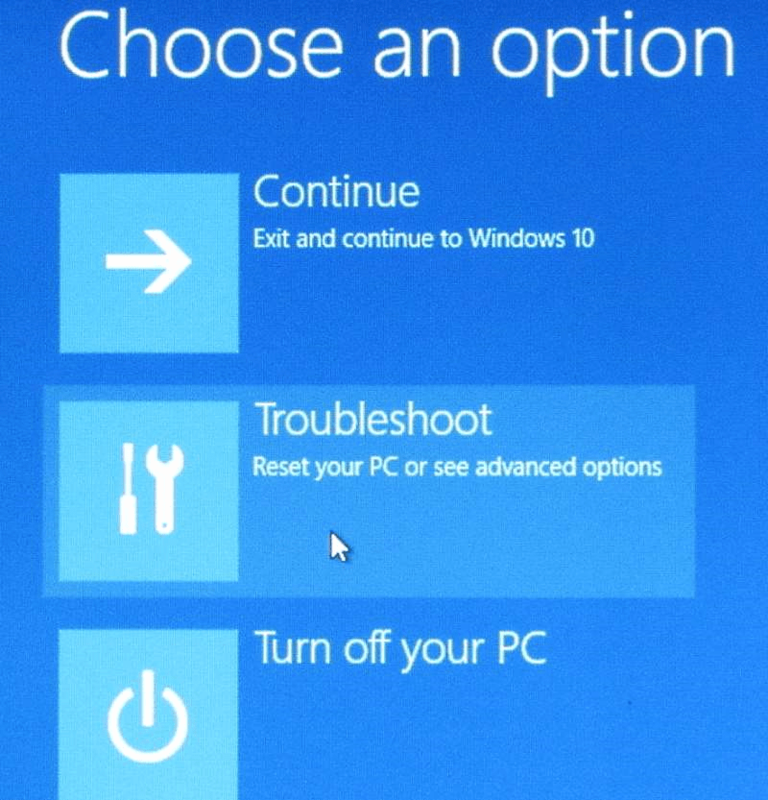 You may provide feedback here stating the reasons you are uninstalling Windows 10. It is optional, however might be useful for Microsoft to improve Windows 10 in future. Click the ‘Next’ button to continue. 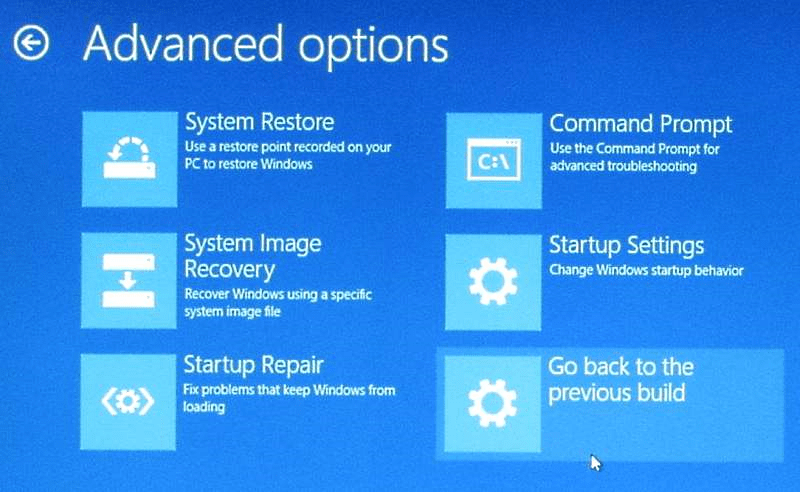 Click on the ‘Go Back to Windows …’ button to start the actual recovery / roll back process. After the recovery / rollback process has completed open File Explorer and check the contents of the C: partition. You will notice the Windows.old folder has been deleted. 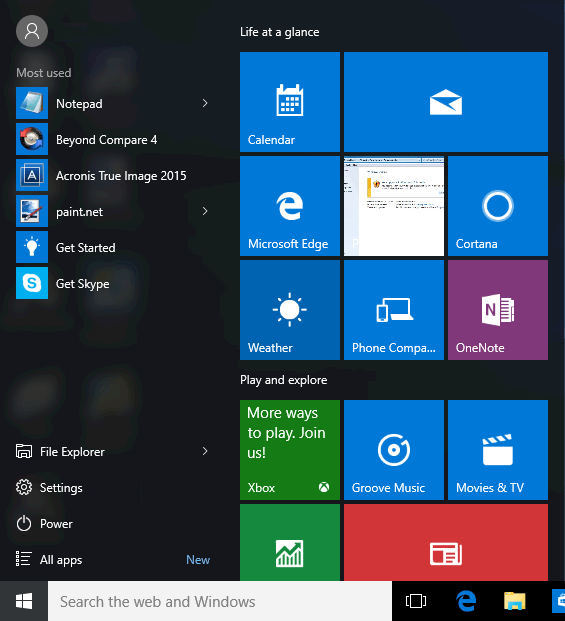 You may notice the GWX icon in the right hand side of the taskbar. 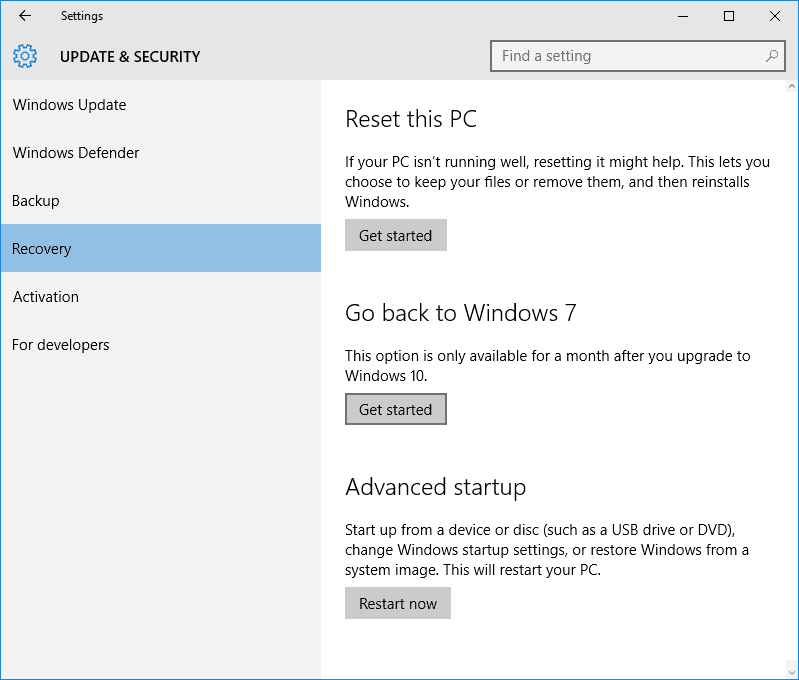 You can use this to re-install the free version Windows 10 anytime within 1 year from July 29th, 2015. Alternate means of accessing the Roll Back / Go Back to previous version option. You have two ways of accessing the alternate method, both involve using the Power/Reset option. 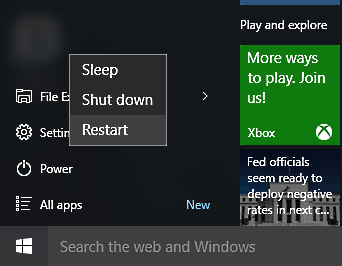 A) From within Windows 10 click the ‘Start’ menu, select the ‘Power’ option and the hold down the ‘Shift’ key and click on the ‘Restart’ option. 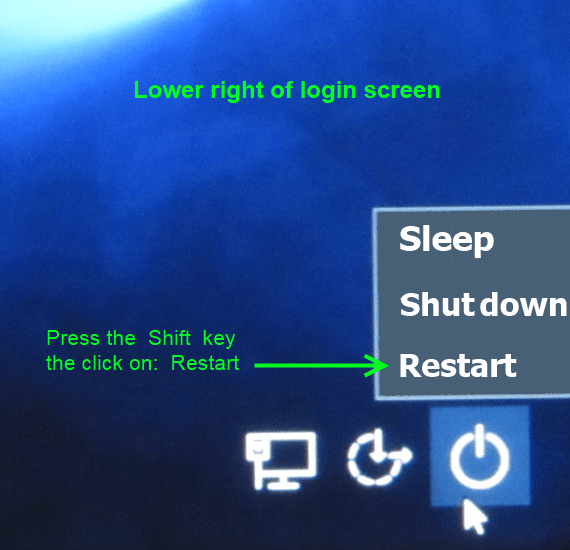 B) After powering on the computer and before you enter your password click on the ‘Power’ button icon located in the lower right corner of the display, hold down the ‘Shift’ key and then click on the ‘Restart’ option. Your computer will reboot, choose your account name and password to continue and then you should see the GUI Boot Menu when the computer restarts. Click on the ‘Troubleshoot’ option. 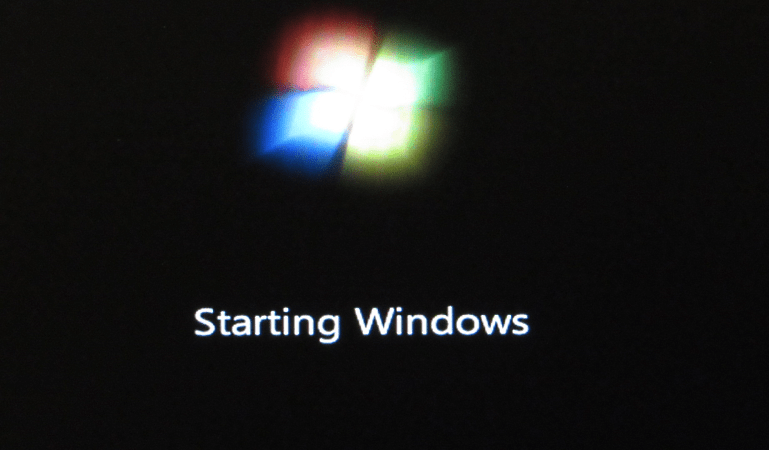 Now click on the ‘Go back to Windows 7 / 8.1’ or previous build option. 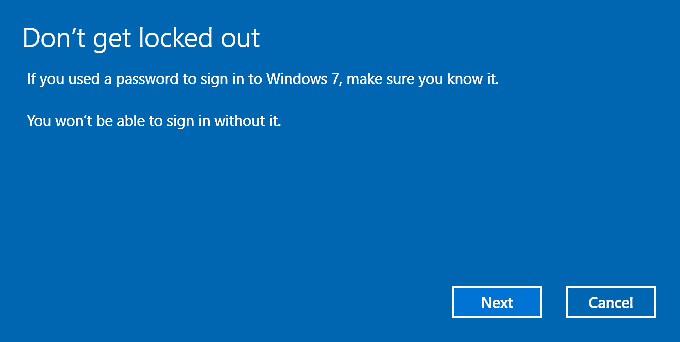 The restoration / roll back process will start by rebooting your computer after which you will be prompted to choose an account (use your Windows 7 account and password if you created a new account while you using Windows 10). 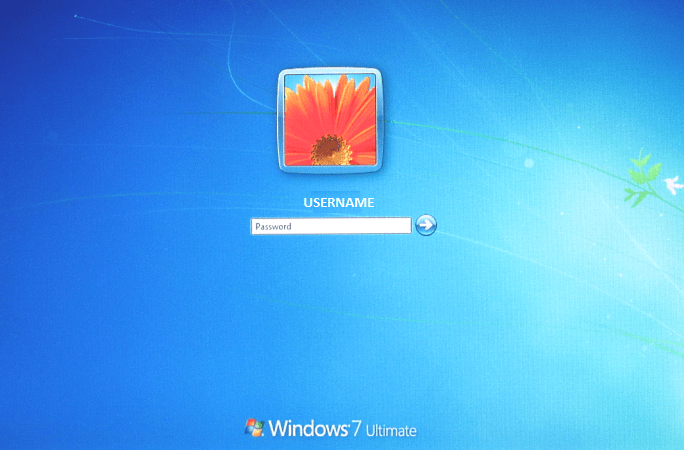 After you enter your password you will have the option to either ‘Go back to previous build’ which will restore Windows 7 or 8.1 or ‘Cancel’ the recovery / roll back and return to Windows 10.